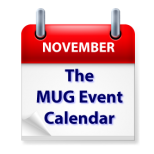 The MUG Event Calendar recovers from the U.S. holiday weekend with an appearance by iOS editing software developer Luma Touch at a California creative pro group, an appearance by Gary Rosenweig of MacMost at one Florida group, and the final meeting of another Florida group. Los Angeles Creative Pro Users Group – “We welcome Nicholas D. Johnson and Will Merrick, editors of the critically acclaimed thriller, Searching. Searching takes place almost entirely on smartphone and laptop screens and Will and Nick will discuss their unique workflow with USC Professor and editor Norman Hollyn. We also welcome Luma Touch who will show us their much talked about and powerful muli-track video editor LumaFusion for IOS. Plus: Are the new Apple Mac Minis and Blackmagic eGPU Pros ready for pro use? Michael Kammeswill show us, and yes we will have the new Mac Mini and Blackmagic eGPU Pro in person.